Britta Invel is an Imperial acrobat found in Castle Leyawiin's dining hall. 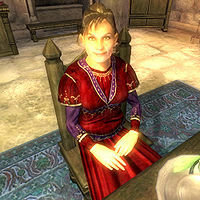 She and her husband Jaras are guests of Countess Alessia Caro during Sanguine's quest, which is the only time she can be found in-game. The player can find Britta in the dining hall, seated at a table with other members of the Countess' dinner party, from 6pm to midnight (on whatever day the player arrives). She will chat quietly with the other members of the party either until the party ends or the player casts the spell Stark Reality for Sanguine. At that point she will immediately stand up and begin running wildly around the room, evidently mortified at her sudden loss of clothing. Once the next stage of the quest has begun, Britta will disappear entirely, presumably too ashamed to return to the Countess' social functions. Britta wears a set of upper class clothing: a red velvet blouse, red velvet garment and a pair of blue suede shoes. She also carries a bread loaf, an apple and a large amount of gold. This page was last modified on 20 October 2015, at 05:19.